While complex themes run deep throughout the novel, its plot is thin, almost nonexistent. In the opening pages, a flashback introduces us to Elfrieda and Yolandi, better known as Elf and Yoli, restless sisters in a small Mennonite community that seeks complete control of their upbringing. Jumping to the present, we find that Yoli, the narrator and protagonist of the novel, has traveled to Winnipeg from her home in Toronto because Elf, a brilliant and successful classical pianist, has attempted suicide—and not for the first time. Elf is now in a hospital psych ward refusing to cooperate with the resident shrinks. Most of the suspense revolves around whether Elf can escape to try again. At first it is a struggle between Elf’s determination to die and Yoli’s determination to keep her alive. Gradually, the issue becomes more challenging, as Elf tries to persuade her sister to take her to Switzerland, where doctor-assisted suicide for depression is legal, and Yoli starts to give it serious thought. Their conversations, and frequent flashbacks to their youth, give a strong sense of the close and loving bonds that join the sisters and make the decision so difficult for Yoli. Fortunately for us, Toews does not give us a break. She tackles the issues head-on, in a way that will leave readers laughing and crying simultaneously—and more important, thinking. The ethical issues raised are treated with the complexity they deserve. Don’t expect any simple answers or, fortunately, any preaching. Toews sees both sides of the arguments, and so do her characters. The novel is beautifully written. The flashbacks to Yoli and Elf’s childhood under Mennonite rule are vivid and energetic. Toews perfectly captures the casual manner in which close-knit siblings enjoy and irritate each other. The dialogue is realistic and funny, ranging over topics from the mundane to the cosmic. Toews is so good she can let her characters talk about books and art and meaning of life without sounding pedantic or pretentious. The characters—all of them—are smart, decent, and confused. We feel for them and we respect them. The disparity between Elf and Yoli’s situations and their respective views on life is the question that Yoli struggles to answer through much of the novel. Why can’t Elf be happy? Is there some suicide gene that she inherited from her father? What keeps a person who seemingly has everything from enjoying her blessings? 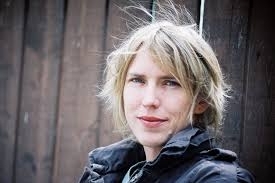 Toews has acknowledged that the novel draws heavily on her own experiences. She, too, was raised in a small, rural Mennonite community. Her father committed suicide in 1998 and twelve years later her sister took her own life. 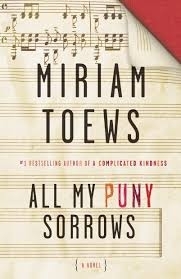 When All My Puny Sorrows was released in April 2014, Toews told Canada’s National Post, “For me, writing is an act of survival.” And therein lies an important element of the novel. While it deals extensively with death and grieving, it is also a book of hope; Yoli and the other characters who love Elf and have to deal with her suicidal wishes are also survivors, learning to go on and to lean on each other, as they navigate the trials they face.